Only a decade later, when these journals end, Ginsberg had been transformed—at least in the public consciousness—into a symbol of radical youth, and, soon thereafter, would come to stand as the prophet of the drug culture and mid-60s hippiedom. What happened to Ginsberg in those ten years out of which came both his great poems—Howl and Kaddish—cannot but be fascinating to anyone interested in American cultural life. But for those seeking such information, Ginsberg’s Journals may seem to be a great disappointment. A collection of fragmentary descriptions (mostly of dreams), incomplete poems, brief expositions and seemingly unimportant facts, these journals seldom explain and even less often reflect the public Ginsberg most of us want to know about. 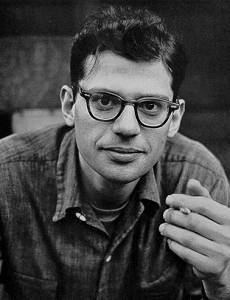 However, Ginsberg is not being coy. As he had learned from the haiku, “Never try to write of relations themselves.” And in fact these journals are illuminating when this is taken into account—illuminating not so much in terms of what happened to Ginsberg in a social or political context, but in terms of the personality behind the cultural events. This is not to say that the Journals are merely introspective. All of the five notebooks published here deal with some aspects of Ginsberg’s social and political actions. And two of the largest notebooks, written on travels to Mexico and later to France, Tangier, Greece, Israel and back to Africa, are often most effective in their lyrical poetry and descriptive prose. Other notebooks, moreover, contain a wealth of literary and political memorabilia, including a conversation with Ginsberg’s hometown poet and friend, William Carlos Williams, brief descriptions of encounters with Dylan Thomas, T. S. Eliot, and Eleanor Roosevelt, and, of course, vignettes of Ginsberg’s relationships with close friends and lovers such as Corso, Cassady, Orlovsky, and Kerouac. But the importance of the journals lies in their revelation of Ginsberg’s innermost perceptions and fears rather than in outward events. And it is in the dream—and the dream made public through poetry—that Ginsberg comes alive as an individual, as a compelling and compelled man. The most important thing about dreams, Ginsberg explains, “is the existence in them of magical emotions to which waking Consciousness is not ordinarily sentient.” What these journals make clear is that above everything else, even political change, it was this non-sentient emotion which in these years Ginsberg most sought. If, on the one hand, like Ezra Pound, Ginsberg saw in language’s “worn out” abstractions the need for “objective images” which when put haiku-style next to one another made for new relationships in the universe, on the other hand Ginsberg was (and is still) an avowed Romantic, a surrealist poet who through the unconscious attempts to uncover the mysteries of the universe present and past. What these journals reveal then is a poet trying to change objectively the culture in which he lives, while simultaneously coming to terms with a self that fears change and is constantly in search of the security of identity and love. From the beginning of these journals to the last pages written in Mombasa, Ginsberg’s dreams betray the conflict. The editor, Gordon Ball, describes the pattern in terms of what he calls “The Room Dreams”: Ginsberg dreams of finding himself in a strange room, building or street and attempts to get back to a place of security. Associated with the dream is the presence of an older male, often Ginsberg’s brother or close friends, or occasionally poet Louis Ginsberg, the father himself. Always Ginsberg is confused or endangered in these dreams and most often the safety or security he seeks is associated with his past. Ginsberg obviously found a middle ground in his role as prophet, as one who could speak to the culture of its wrongs, but could also foretell the future and with that knowledge protect himself from the change it brought. And there is certainly enough evidence to believe that in his role of prophet Ginsberg discovered his true self. The recent disclosures of the CIA and the FBI show Ginsberg’s a paranoia and political accusations often to have been justified; moreover, Ginsberg’s October, 1959 description of presidential candidate John F. Kennedy—“He has a hole in his back. Thru which Death will enter.”—and his November, 1960 dream of Richard Nixon—in which Nixon is described as “an abused prisoner alone in his breakfast nook nervously being self-contained reading the papers”—all help the reader to believe in Ginsberg’s prophetic powers. Ultimately, however, the Ginsberg that is most convincing is the man: the highly intelligent, self-questioning critic of his country who, perceiving himself and his countrymen running head-long into destruction, desperately seeks for a shared freedom and peace. This is a difficult book, often unrewarding, and it has a few editorial problems—a confusion in the introductory pages, an erratic use of footnotes and the lack of an index—but for its utterly fascinating revelation of one of our most important poets, it is a remarkable work. Reprinted from The Washington Post Book World, October 2, 1977. Book World editor Bill McPherson reported to me that soon after this review Ginsberg sent him an angry letter in response. In retrospect, it is clear that I focused too heavily on Ginsberg’s doubts and paranoia as opposed to his poetic achievements, but Journals also was not centered on that aspect of his work. Over the years I have continued to have ambivalent feelings about Ginsberg’s writing, in part because of its insistence upon self-mythology and, ultimately, out of agreement with Allen’s own assessment that political writing does not always lead to good art. Yet I cannot imagine the 1950s without the clarion call of “Howl!” And there were wonderful works throughout his entire career. About a year after the above review, I delivered a paper on manifestoes at the Modern Language Association, discussing at length the statements of various American poets, Ginsberg among them. Ginsberg was in the audience, and, in the question and answer period, expressed his appreciation that I had at least sought out what poets were attempting through their own comments on their poetics. Afterwards, I personally expressed my admiration of his work. By this time his publisher had used a comment from my review on the back cover of the paperback edition of Journals. All, apparently, had been forgiven—or perhaps Ginsberg recognized that the review I’d written was basically a positive one. I have previously written in the 2005 volume of My Year about Ginsberg’s and my relationship at The William Carlos Williams Centennial Conference in Orono, Maine in 1983. I’m a Jew! A nice jewish boy? Gay in fact pederast? I’m exaggerating? Columbia Alumnus, class of ’48. Beat icon, students tell me.